no body never mind, 001 is part of the project NBNM, which consists of three pieces addressing the themes body / mind, outside / inside, emotion / feeling, me / others. no body never mind, 001 is a performance for two performers and two tatoo artists. 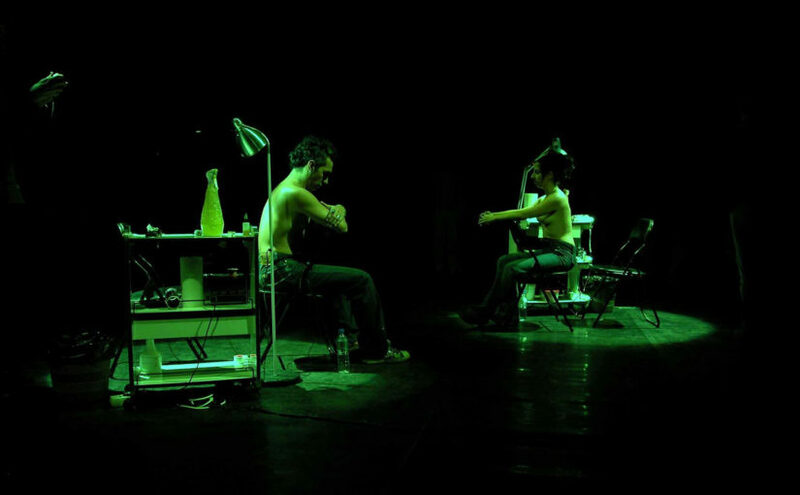 This performance consists of tattooing the bodies of the two performers with the title of the performance No Body Never Mind. Half of the heading is inscribed in each body: No Body in the body of the female performer by a male tatooer and Never Mind in the body of the male performer by a female tatooer, while one can hear the recorded sound of their heartbeats. This performance intends to create a space and a time for a careful thinking about the body of the performer and the political space that it occupies in society.